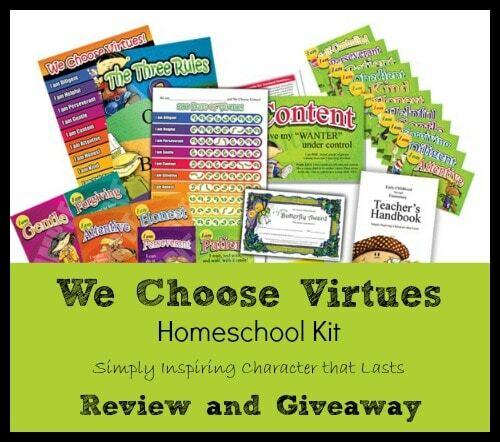 Sponsored Post: Author has received a We Choose Virtues Homeschool Kit in return for an honest review at The Curriculum Choice as part of a sponsorship package. Affiliate links appear in this post. I am very excited to share with you a review of an excellent product from my Titus 2:1 Conference personal sponsor, We Choose Virtues! We Choose Virtues is a company dedicated to creating beautiful and fun tools for parents and teachers; empowering them to not only teach, but inspire their children and students to live a virtue-filled life. Character training is hard work, but We Choose Virtues believes that it can be fun, too! We Choose Virtues has given our family a common language to use when disciplining. This has been the greatest gift and feature of the program for our family. We have been focusing on 1 virtue per week. Every morning we sit down with the Parenting Cards and read through the Virtue, the catch phrase, the “I am not” antonyms, and the bible verse*. We read the story about the Kid of Virtueville that represents our selected virtue and talk about real ways we can live out that virtue throughout the day. Then, for example, if Billy starts to act a little wild, all I have to say is “self-control!” or “Oboe Joe!” and he is able to recite the virtue catchphrase and understand what behavior I expect him to correct at that moment. We Choose Virtues helps me, too! Instead of getting frustrated with Billy when I need to correct his behavior, I remember to take a breath and calmly use the We Choose Virtues language to address those moments. The Homeschool Kit is packed with colorful, fun products to use as you teach the virtues to your children and remind them to display those virtues throughout the day. In addition to the Parenting Cards, the We Choose Virtues Homeschool Kit includes a “100 Days of Virtues” poster. At the beginning we chose a “prize” that Billy would earn (in our case, a trip to Dave & Busters) and each day a virtue has been successfully practiced, we add a butterfly sticker to the poster! I can also use the Virtue User Review notepad as a written acknowledgement of what went well and what virtue needs work on any particular day. The Teachers Handbook also has some fun activity ideas that can make practicing virtues just seem like playing games! There are so many more great resources included in the Homeschool Kit that I could write another whole post about it! *The Homeschool Kit is available in the NIV and now the King James versions and is also available in a secular/public school version which does not include the scripture. The We Choose Virtues Homeschool Kit is regularly $98.99 (still an amazing price for all of these wonderful resources!) – but through the month of April We Choose Virtues has extended the sale on this awesome kit! Use promo code HOME20 to receive 20% off the Homeschool Kit! This sale makes now the best time of the year to buy (except black Friday)! Click Here to head over to the We Choose Virtues shop and check the Homeschool Kit our for yourself! Be sure to visit and ‘like’ We Choose Virtues on Facebook to keep up with the latest! Enter using the Rafflecopter widget below to Win a set of Parenting Cards ($34.99 value!) from We Choose Virtues! I want to use this to help the Moms at my church – to provide them with a product they can use and help guide their children. My children need to be taught alot of character traits but disrespect is a big one amongst their siblings. I’m trying real hard to correct it. I would love to use this to teach my children Biblical character traits. proper character traits seems to be lacking in the world today… I want to make sure my child doesn’t fall victim… this package looks like it would be a great addition to our family’s school plan! Thanks for the chance! I think the catch-phrases sound like they would be helpful for my children. Awesome!! I do believe I will order this for the fall. Thanks for sharing! What an awesome resource to have for any homeschool. I think this would be lovely for my child and for all of his homeschool buddies in coop. 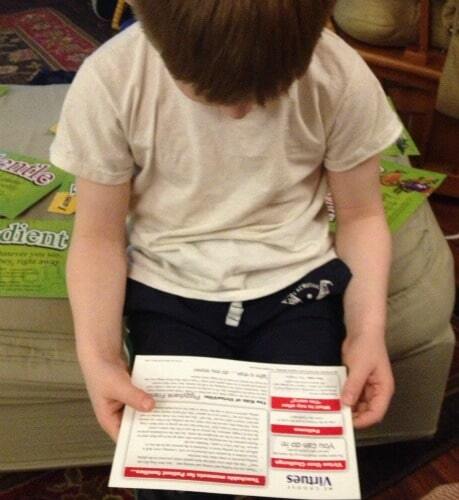 I’ve been using flash cards with my 3 year old and focusing on getting him to be obedient…AMAZING the difference!! If I say, “What’s our rule?” He answers, “Be obedient! I will do what you say right away!” And then does it!!!! This would help us take it even further!!!! I would use it with our family to homeschool! I think this would be a fun way to incorporate some character training other than verbally correcting them all the time. I think this would help my children see that the virtues we teach at home aren’t just things that Mom and Dad say, but that they are things which are so important that we hang them on the walls, study them in homeschool, and pray to carry out in our everyday lives. These lovely posters and cards, etc., would be a beautiful visual addition to our homeschool in that they would reinforce what we already talk about. Thanks for the giveaway! I have been wanting this but the price has been too much…. We definitely need some help in addition to prayer! Some of my children are so motivated by stickers. I love that aspect of the material. It would be SO nice to use something like this to have as backup for when you want to reiterate a character trait at a time when a child is either behaving (positive reinforcement) or not! These would be a wonderful tool to help teach my kids to understand different character traits that may not have even occurred to them! I would love to win these to use with my sons. It will assist us with bible studies and enrichment in our homeschool. Biblicsk Character traits are the most important. Would love this, have been eyeing this for awhile to add to our homeschool character study! it’s always great to have the Bible to back up what you are trying to teach your kids, especially biblical character traits. I would be so excited to use these with our boys, thansk! I think these would really help my three girls learn proper character traits better than anything I could try to tell them. They enjoy reading little things and they enjoy cartoons. My youngest is only 3, so I would like to start instilling values and character traits that will help her throughout her life early. 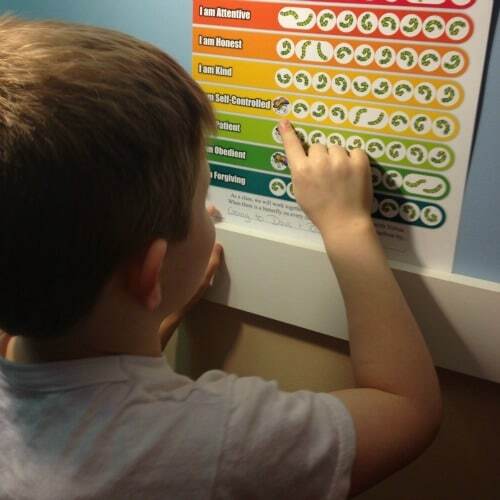 As for my older children; they could all benefit from a review of appropriate behavior. Where I would use it the most is with my clients. I am a mental health behavioral specialist, so I do in home skill building with children and families. Many of these families would benefit greatly from this program. We have not done much character training. I hear wonderful things about We Choose Virtues, and think this would be great for my children! I’ve been wanting to try these out with my little guys! I love having biblical aids in teaching character training! I have 7 children and could use all the help I can get! Sounds great. There are some bickering and disrespect issues over here. This curriculum would help take the standards of conduct from the subjective (“I didn’t think it was so baaaaddddd!”) to the objective. I’ve used other character sources before, with not much success. I need something that works, to use with my boys! This is something I have been looking at trying for awhile. Thanks for the post. Character training is crucial! These look like great tools! I have been thinking about getting this-it looks great! I home educate my three children ages 5, 6 and 7 and it would be a great way to supplement and guide me in our bible class. Thank you so much for the chance! WCV would help me as the mom and teach to get organized. Sometimes I’m scatter-brained and this system would keep things together nicely for me! I think WCV would help me with the character training of parenting…make things a little more concrete for all of s! Have often been to the website to check out these products and have so wanted to buy some. Maybe this is the month. With five kiddos to train this looks like an excellent resource! Would love to win the WCV homeschool kit to standardized the discipline in our household. I would love to use this program to help build a common language for discipline within our home! I have been following We Choose Virtues for awhile now. My kids and I could use the helpful reminders and tools availble from them. I hope to save up enough to buy them for Christmas. I have an amazing son who wants to know the “why” behind everything. This would help me instill the virtues I want him to have and be able to teach him why! I just came across your site and giveaway through a Google search. I would love to win a set of parenting cards. Thanks for the opportunity! Ooh, we would love the parenting cards! We Choose Virtues looks like a fun way to engage my son in learning these important character traits. I have been looking at it for a while, and I think my son would love it! This looks great, I love to try it with my three little ones. This looks great, I’d love to try it with my three little ones. Interested in this. Thanks so much! I would love to be able to incorporate this in to our homeschooling! Would love to use the We Choose Virtues for my kidos! Love the concept and love how easy it seems to use. I have two rambunctious boys that could greatly use it! I am a homeschooling mom new to this chapter in my life, I have wanted to try this curriculum with my boys next year and would be excited to try a part of it before I order. My kids really need character training and this kit could help get us started! This looks great and I think my little one would really enjoy it! This program sounds great! I think it is a wonderful way to start out the morning for all of us. I like how it would apply to each one of my kids, no matter how old they are! Using this would help give me direction and focus with what to teach my kids and how to teach it. This looks like a very good character building resource. I would like to try it.